Concentrated mouthwash helps to maintain healthy gums and freshens and scents the breath. If used regularly, the mouthwash refreshes the gums and reduces their excessive sensitivity and potential marks from (for example) braces and dental prosthetics. Mouthwash is perfect for the daily care of the oral cavity and complements regular dental care. Oral water Orcann with a unique combination of herbal extracts provides superior care in oral hygiene. Mouthwash freshens up the breath immediately. If used regularly, the mouthwash effectively avoids also any smells from the mouth. 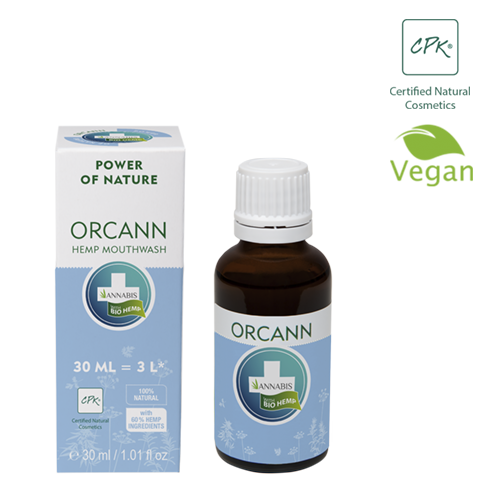 Orcann is a product that can be used in both the diluted and full concentration. The large bottle can be produce up to 3 litres of mouthwash when diluted. The concentrated product can be applied with a damp cotton swab or pad directly on areas as required. For the best results it is appropriate not to eat or drink immediately after application. Orcann meets the standards of natural cosmetics. Vegan friendly. Recommended use: approximately 10 drops into 0.5 dl of lukewarm water, stir it and rinse the mouth. In the undiluted form use a moistened swab / cotton pad to apply directly where required. Ingredients (INCI): Cannabis Sativa Seed Extract, Alcohol Denat., Aqua/Water, Mentha Piperita Oil, Citrus Bergamia Peel Oil Expressed, Salvia Officinalis Oil, Stevia Rebaudiana Extract.